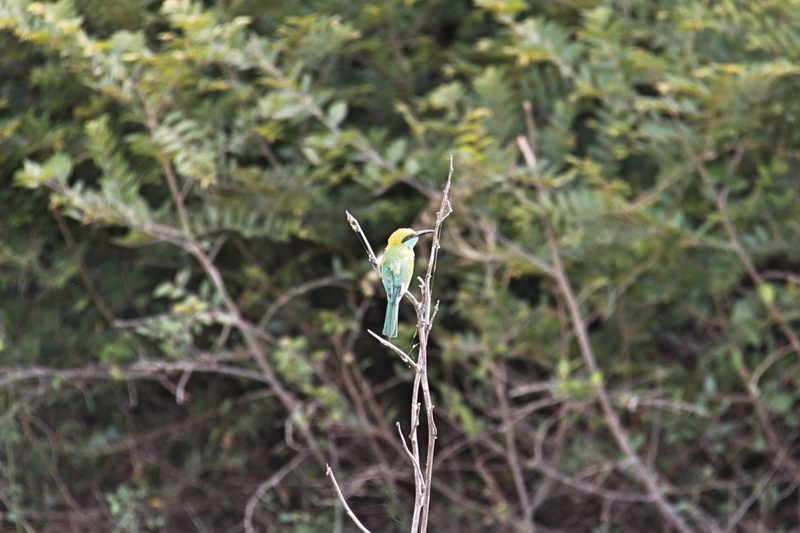 Sri Lanka is one of the best places in South Asia to see wildlife. In fact, that was a key reason we wanted to go there. Being animal lovers, we’ve always wanted take a safari to see wild animals in their natural environment. We haven’t yet made it to Africa, so Udawalawe seemed like a great alternative. We were keen to see elephants, but we wanted to avoid the usual tourist traps, where elephants are often used and abused. 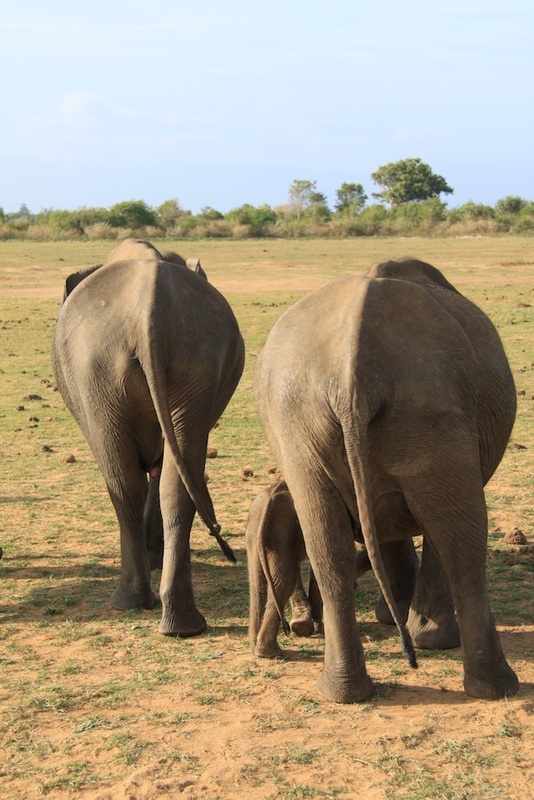 The most ethical way to see elephants is to see them in the wild, and Udawalawe National Park is known for having large herds of wild elephants. A young elephant in the park. 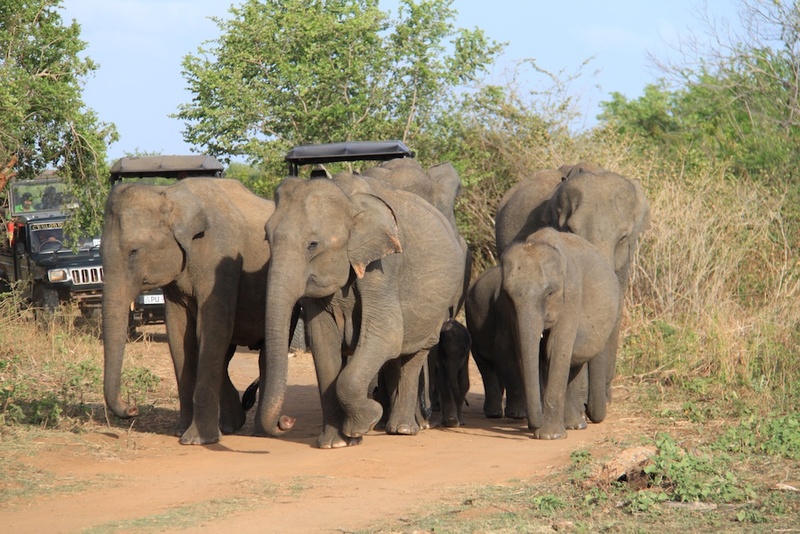 Hundreds of elephants call Udawalawe home. In fact, it has the highest density of elephants anywhere in Asia. 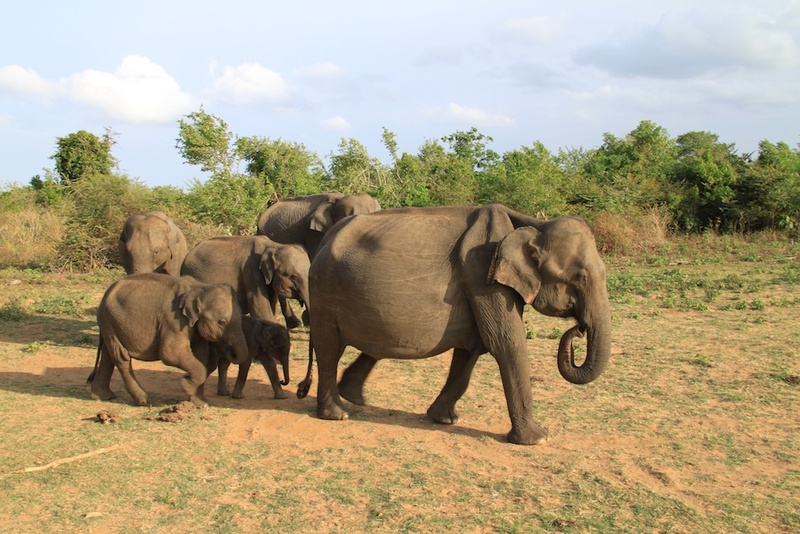 Covering 30,821 hectares of land, it is the third largest national park in Sri Lanka and the best place to see elephants in the wild. 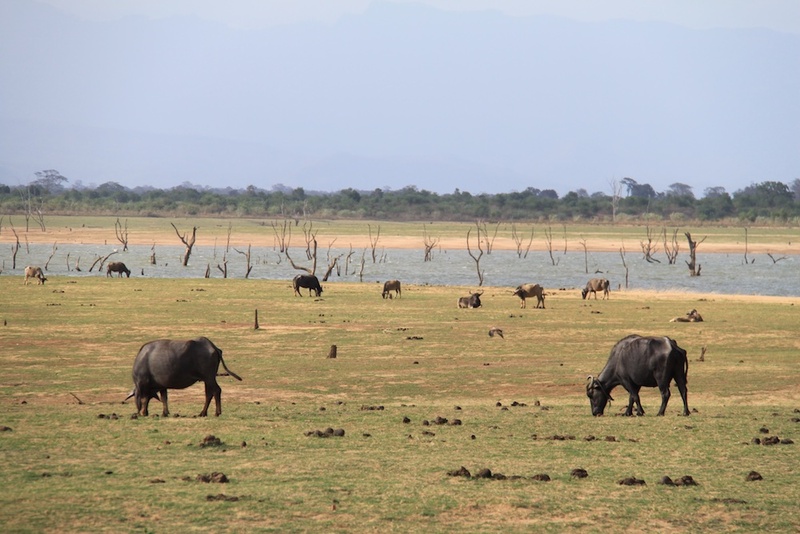 In June 1972 Udawalawe was declared a national park, providing sanctuary to animals displaced by the construction of the Udawalawe Reservoir. Since then the park has become a major eco tourism destination. An elephant’s family hanging out near the reservoir. 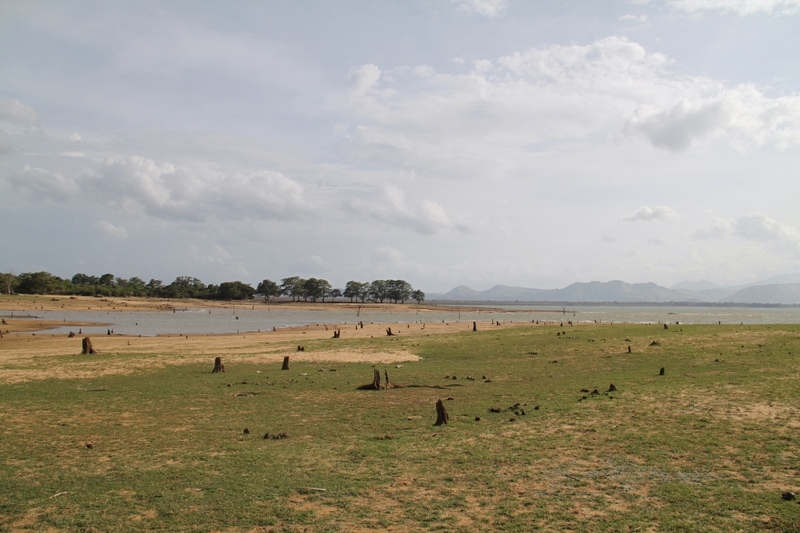 Udawalawe is found 200 km south-east of Colombo, Sri Lanka’s capital city. Ella or Hill Country: Between two and two and a half hours. If you are on a budget, there are also direct buses from Colombo to the park, but you will need to change buses if you are coming from Hill Country or Tangalle. We hired a private driver who drove us around Sri Lanka during our two-week visit. A mum and her calf. Only 4WD vehicles can enter the park. If you‘re on a tight budget, you can arrange a driver independently at the park entrance (catch a taxi or tuk tuk to get there). At the entrance, you’ll find many drivers offering their services, and you can negotiate a price. Alternatively, arrange your safari through your hotel. This will be slightly more expensive, but also more convenient and reliable. Your hotel will arrange both pick-up and drop-off, and most will use knowledgeable and trusted drivers and guides. 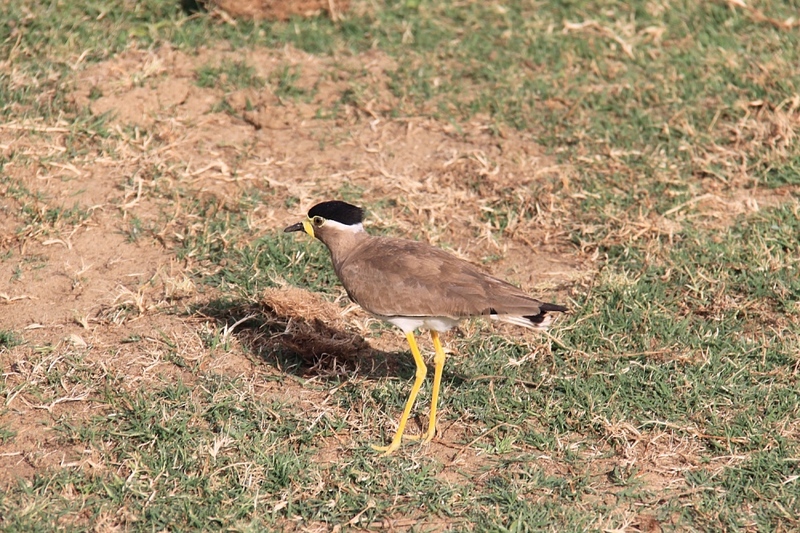 Having a guide who is knowledgeable about the park and its inhabitants is key to having a great experience. 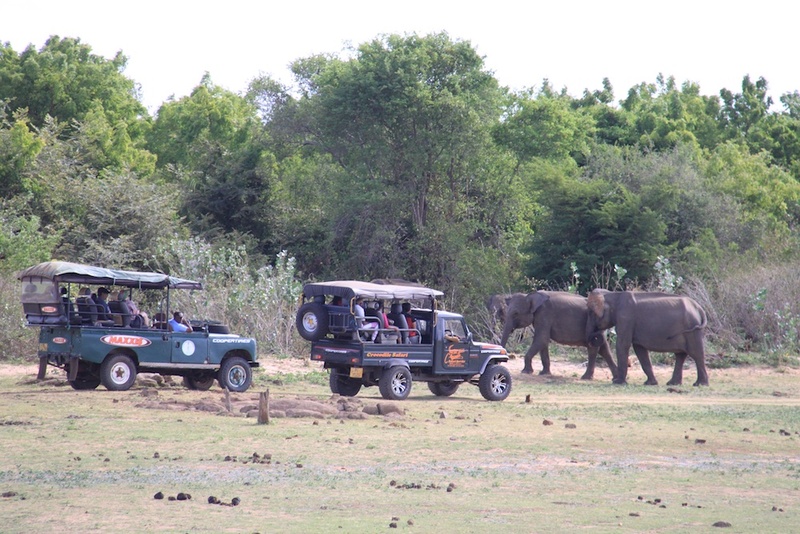 The 4WD vehicles used inside Udawalawe National Park. How much does the safari cost? The price of the safari will vary based on the option you choose, and who you book through. You can expect to pay anywhere between Rs 3500 to Rs 5000 for the vehicle and driver hire for a three-hour sunrise or sunset tour. Entrance to the park will be an additional cost. Like many Sri Lankan attractions, there are different prices for locals and tourists. Locals pay Rs 60 per adult, while tourists pay Rs2058. Bear in mind that you must also pay your guide’s local entrance fee. Tip: Jeeps hold up to eight people and jeep hire costs the same regardless of the number of occupants. If you’re traveling alone, you might want to join up with other travelers to lower the costs. Our driver picked us up from our hotel at 3 pm and we made our way to the park for our sunset safari. The park mainly consists of dry grass and scrubland, with some water holes where the animals congregate. It didn’t take long to spot our first elephant. Within the first five minutes, we came to a stop next to one happily eating on the side of the track. It only got better as we continued driving through the park. 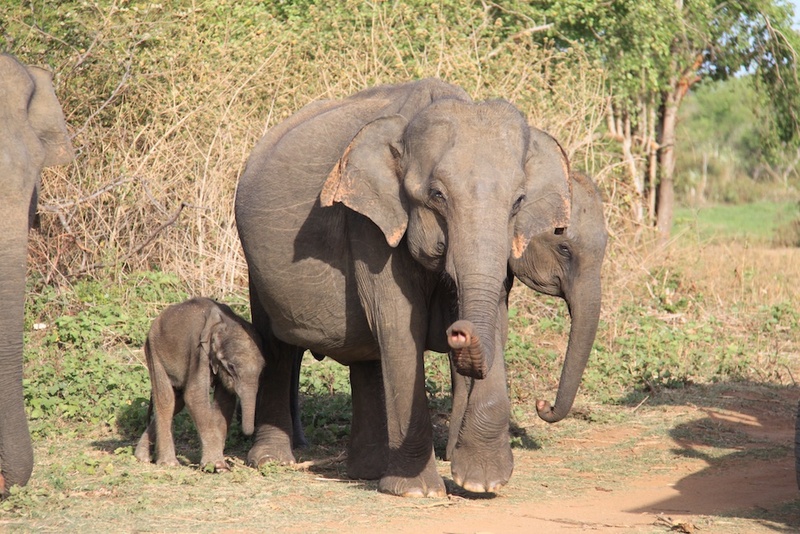 Our first elephant sighting in Udawalawe. We lost count of the number of elephants we saw. Our guide reckoned it was close to one hundred. He said we were very lucky because some people only see a handful! I was too busy photographing them to confirm his count, but we certainly saw many more elephants than we’d ever expected to. Lots of elephants around the water holes, both big and small! Watching these animals in their natural environment was incredible. I loved watching them bathing, playing with each other, foraging, and throwing dirt over their body to keep cool. Seeing them live a free and peaceful life in the park made me so happy. I hate seeing elephants in captivity, kept in chains or in a park for tourists to ride on them. Often they are brutally beaten by their mahout for not performing well enough. Instead, they belong in the wild and everyone should experience them that way. 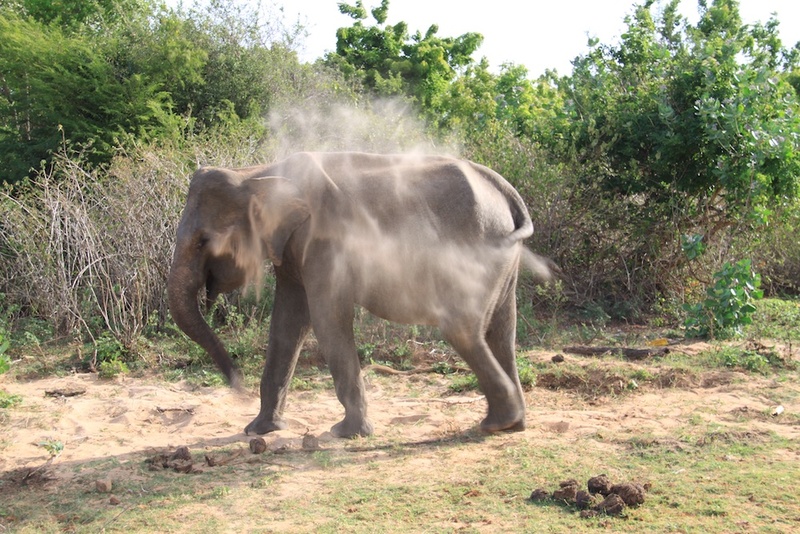 An elephant taking a dirt shower to try and cool down. 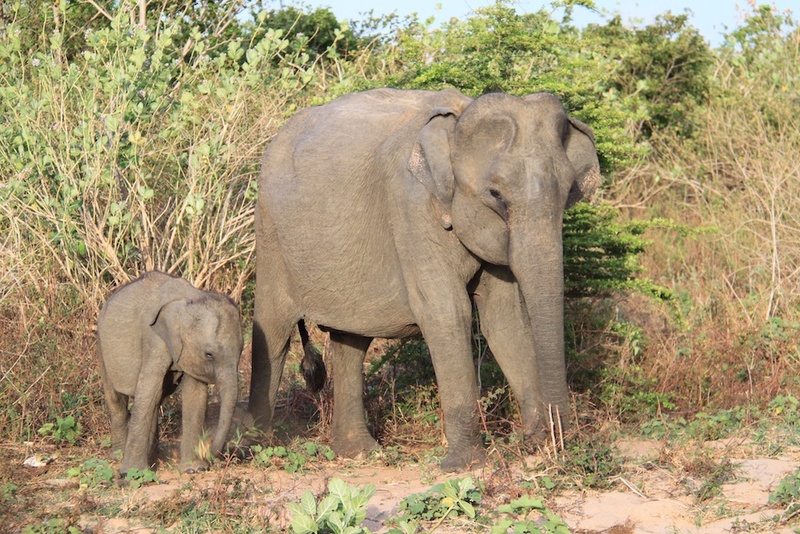 The best part of the safari was watching the many baby elephants, some only a few months old. I was surprised to see that the elephants were completely unbothered by visitors. 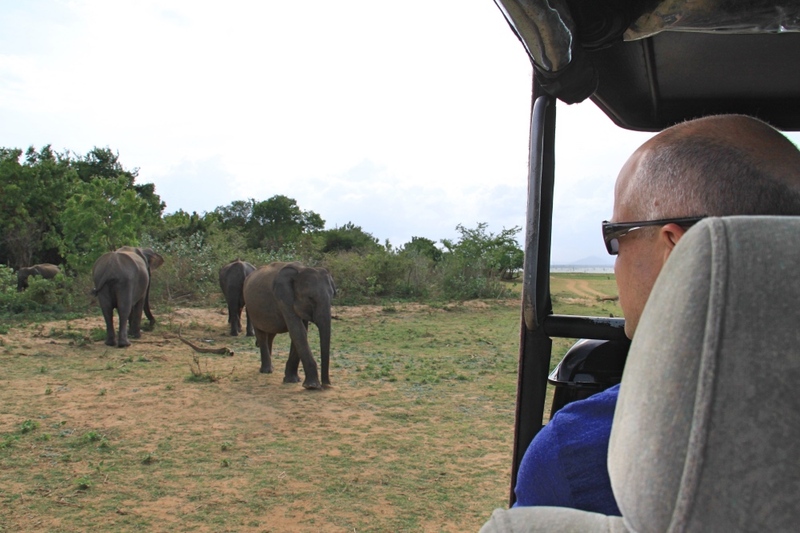 Although our driver always kept a safe distance from them (they are wild animals after all), many of them would approach the jeeps on their own. Though their long trunks, they would sniff the people in the jeeps curiously. 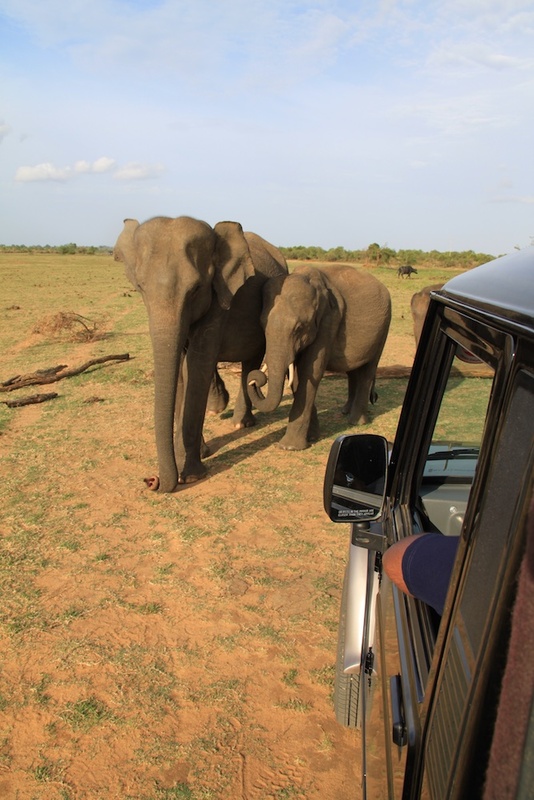 A few elephants came so close to our jeep that we could have reached out and touched them! But most of them just carried on with their business as if we weren’t even there. It was a simply magical experience that we are unlikely to forget anytime soon. Coming closer for a good look at us. 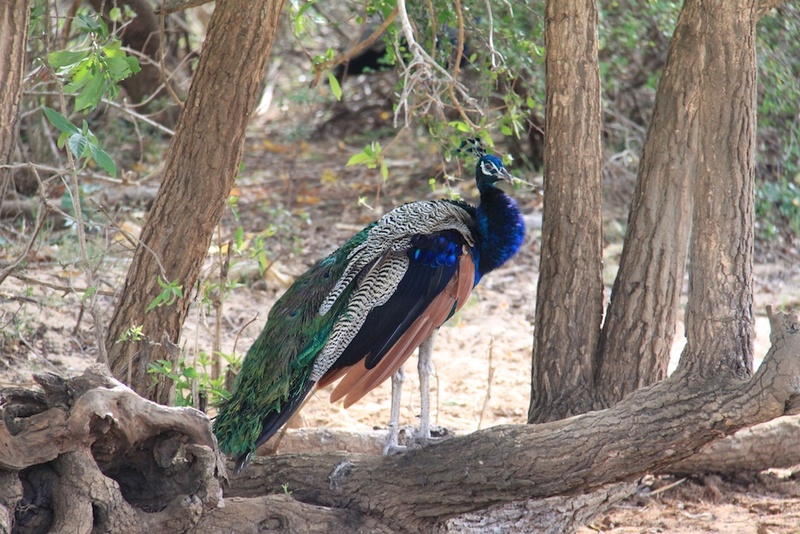 Although the elephants are the main reason to visit Udawalawe, we also saw a great variety of birds, peacocks, deer, water buffalo, and even a crocodile! If you are lucky you may even spot one of only ten leopards who live in the park. We weren’t so lucky. I loved watching the buffalo bathing in the muddy water holes to cool themselves down, with their cute little calves playing nearby. A buffalo and her calf. 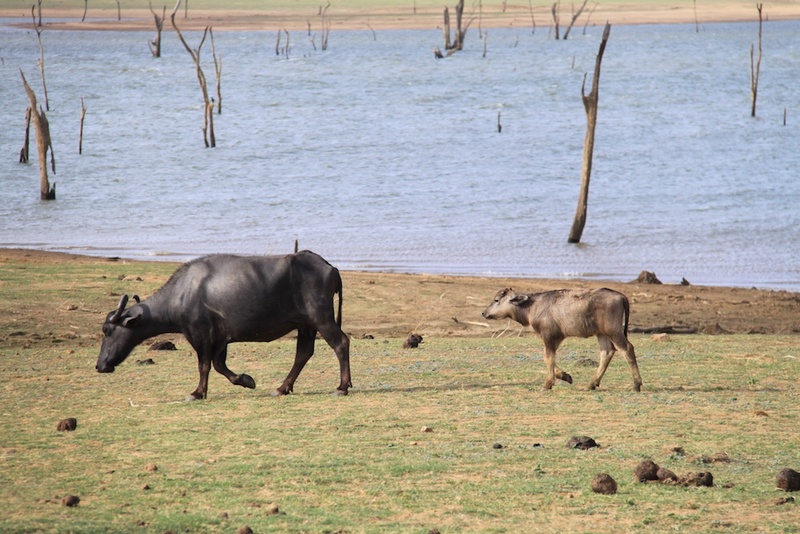 Where to stay near Udawalawe National Park? There is plenty of accommodation around the park, catering for all budgets. We stayed at Kalu’s Hideaway, a short ten-minute drive from the park’s entrance. 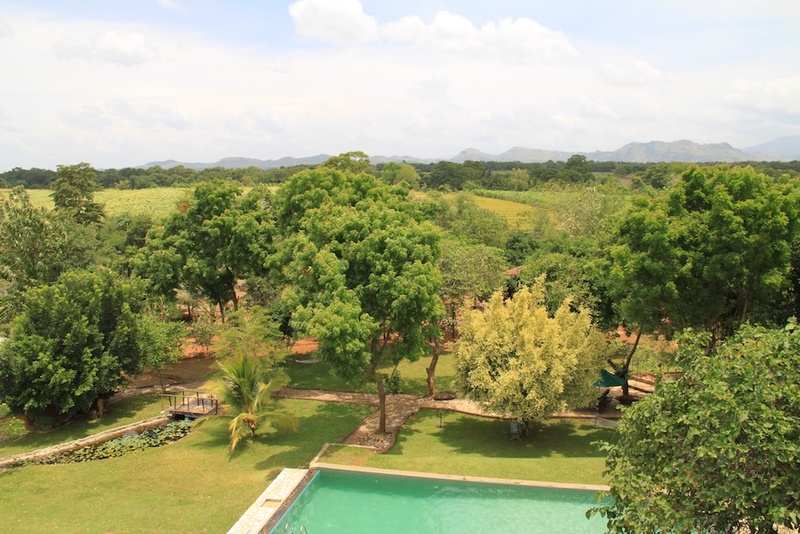 Owned by Romesh Kaluwitharana, a famous Sri Lankan cricketer, it is set on five acres of beautifully manicured gardens. It was a lovely hotel, with very friendly and attentive staff. We were fortunate enough to be upgraded to a suite on the top floor, with fantastic views from every room, including the bathroom! 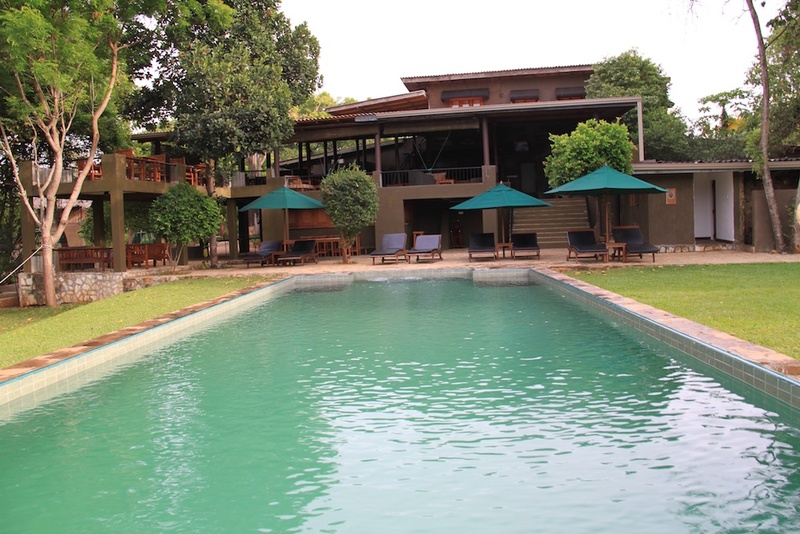 The pool at Kalu’s Hideaway. While in Udawalawe there is one more stop you should make. 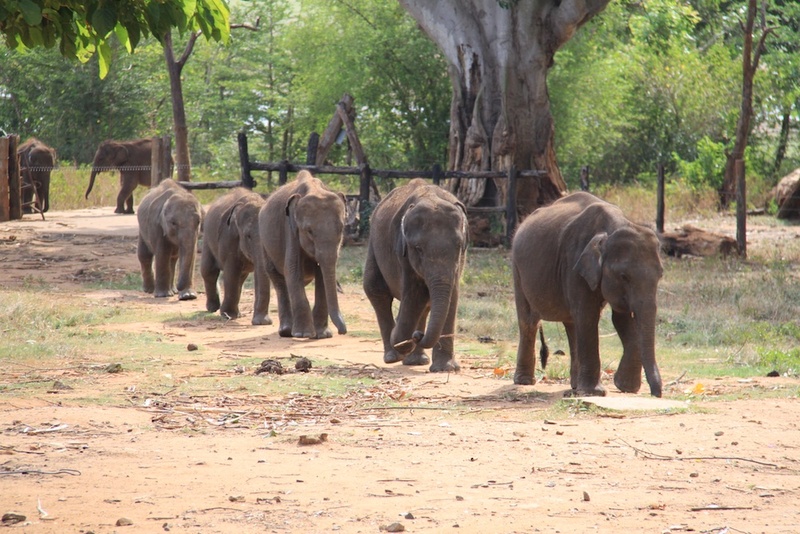 Just ten minutes drive from the park is the Elephant Transit Home, a halfway house for orphaned elephants. 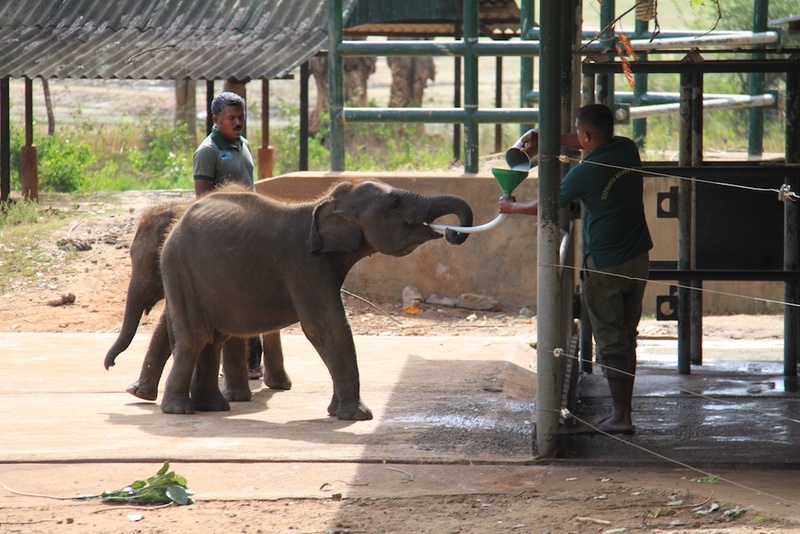 They provide food and medical care to orphaned elephants until their release back into the wild at four years of age. You can visit at feeding time (they are fed every 3 hours, 9 am, 12 pm, 3 pm, and 6 pm) and watch from a viewing platform as they are fed their milk. The young elephants are let in to the feeding area a few at a time, and they know the routine well! An orphan enjoying his milk. They trot excitedly over to the feeding station where they drink their milk through a long funnel. It was entertaining to see their different personalities on display. 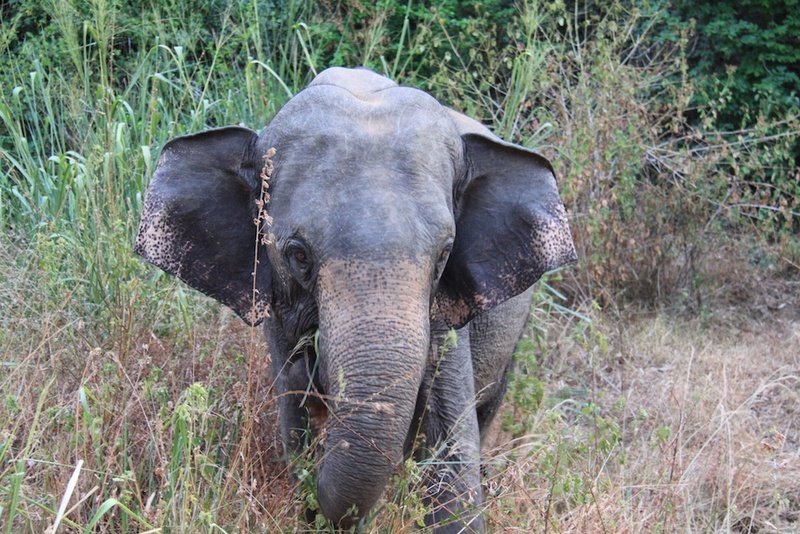 Some of the elephants were well behaved, some were a bit shy, some rather greedy, and some downright cheeky! Once they’d finished drinking, they moved out of the way to let others have a go. Well at least most of them did; others weren’t so keen to give up their spot! 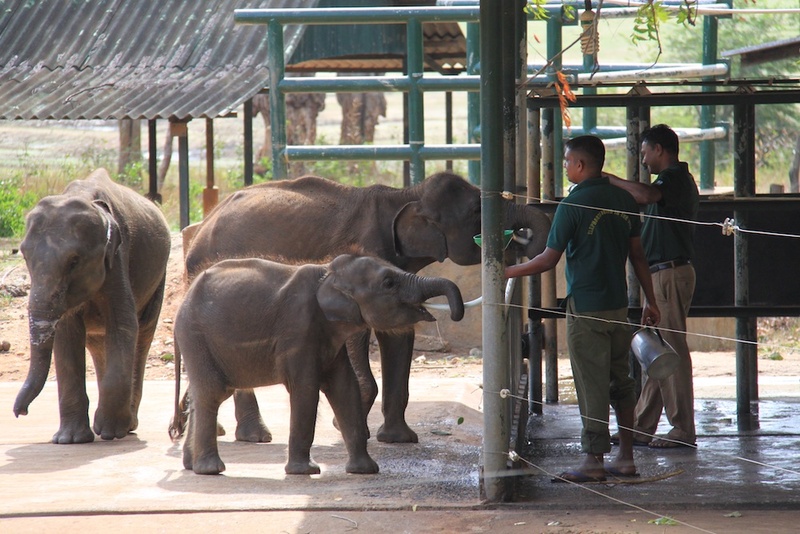 After downing their milk the baby elephants play in the feeding area for a while, until they are led back into the park. The whole experience lasts only about twenty minutes, but we really enjoyed it. I liked that only employees did the feeding, there was no touching the elephants, and they weren’t in chains. 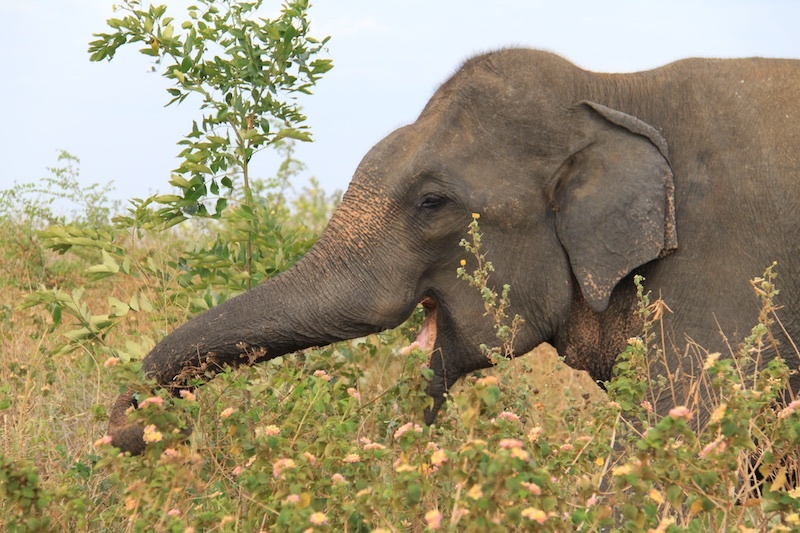 If you are more interested in conservation than in elephant tourism, then the transit home is a great place to visit. It only costs Rs 500 per person to enter, and all proceeds go towards conservation and food for the orphans. 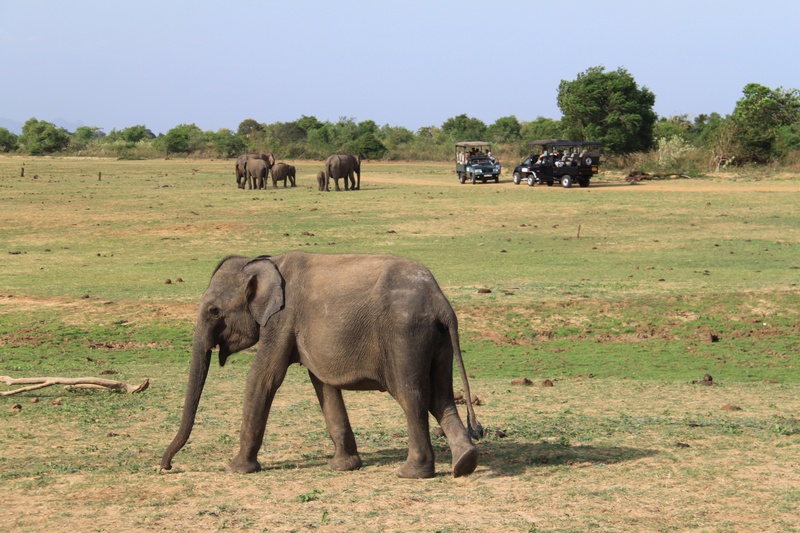 We actually saw a wild elephant in Sri Lanka, even before we visited Udawalawe. On our third day, as we were driving back to our hotel in Sirigiya, our driver suddenly slowed down and stopped the car. A young elephant had popped out of the bushes and had begun to eat his dinner on the side of the road! Apparently, this happens quite a bit in Sri Lanka. In Australia drivers watch for kangaroos, wombats, and echidnas on the road; whereas Sri Lankans drivers look out for elephants! 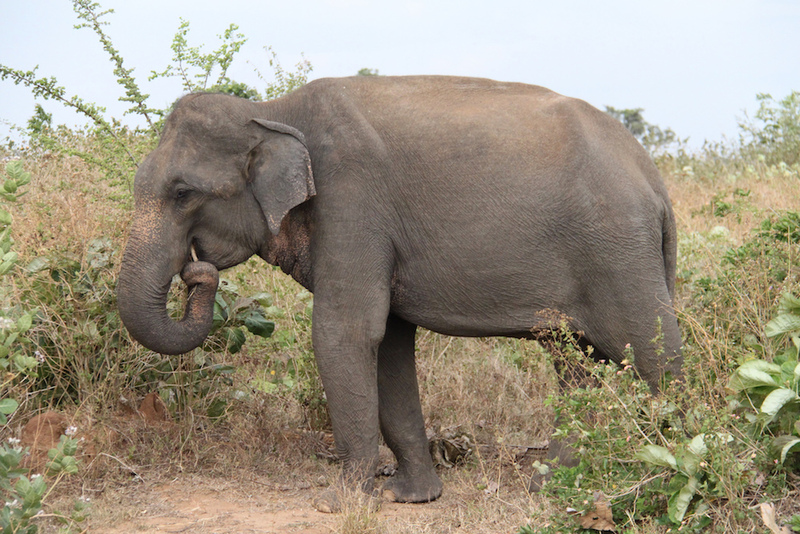 A young elephant eating on the side of the road near Sigiriya. 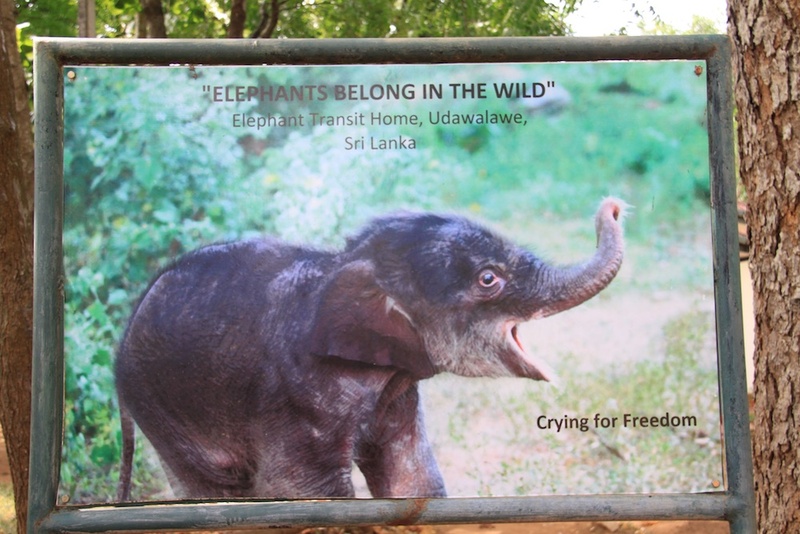 Our time in Udawalawe was the highlight of our visit to Sri Lanka. It’s not every day that you get to see so many elephants in their natural habitat. We highly recommend it to all nature lovers. You won’t regret going there. Have you been on a safari before? Comment below to let us know all about it. Thanks for the info! 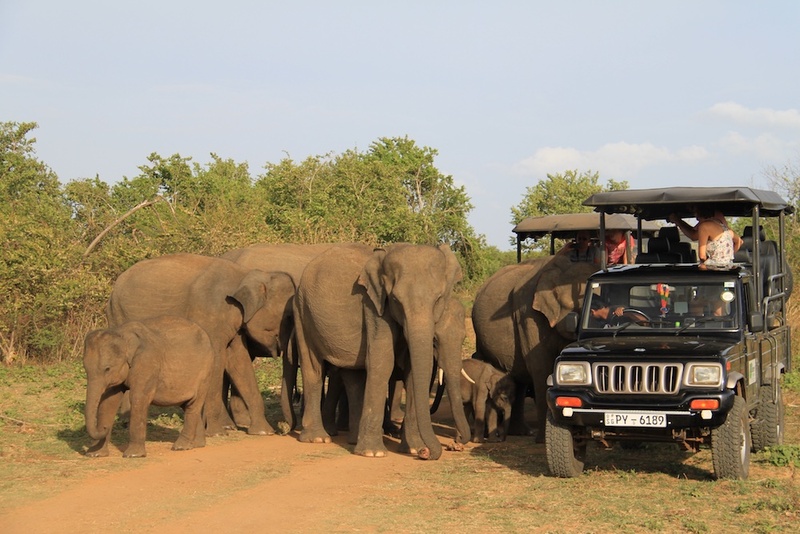 My husband and I are taking our first trip to Sri Lanka in February, and a safari is definitely on our list!! Hi Carrie, You will love Sri Lanka I am sure. The country, the people, the food, everything is beautiful. And yes, you should do a safari for sure. It’s awesome. First I thought it’s somewhere in Africa. What a great time you had at the National Park. The elephants look happy! I’ve been on many safaris in Africa but had no idea that Sri Lanka had a reserve like this where one could see wild Asian elephants. How marvellous. I can sit for hours watching animals in their natural habitat! Thanks Kavey, me too three hours was too short for me! Loved reading your post, and you have some fantastic photos here – lovely shot of the kingfisher! Elephants are wonderful animals, so full of character. I fully agree with you that seeing them behaving naturally in the wild is the only way – and I also hate to see them chained up in place so tourists can goggle at them. Thanks for sharing. Thanks so much Sarah, glad you enjoyed the post and photos. Sri Lanka was on our wishlist for 2017 but we haven’t managed to get there this year. This experience is another reason why we must get there next year. Great pics by the way. Thanks guys, it’s hard to fit everything in as the years end up too short! Hope you get there next year and enjoy it as much as we did. 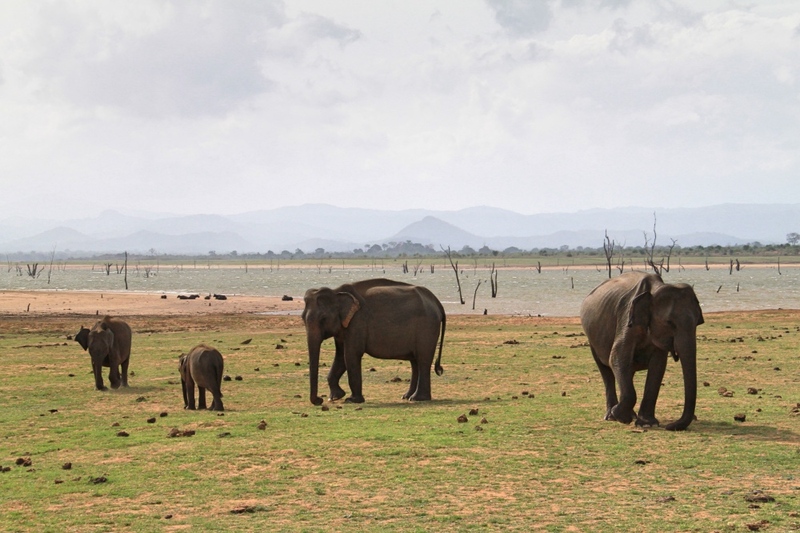 Udawalawe National Park in Sri Lanka is new to me. Good to learn about this National Park. 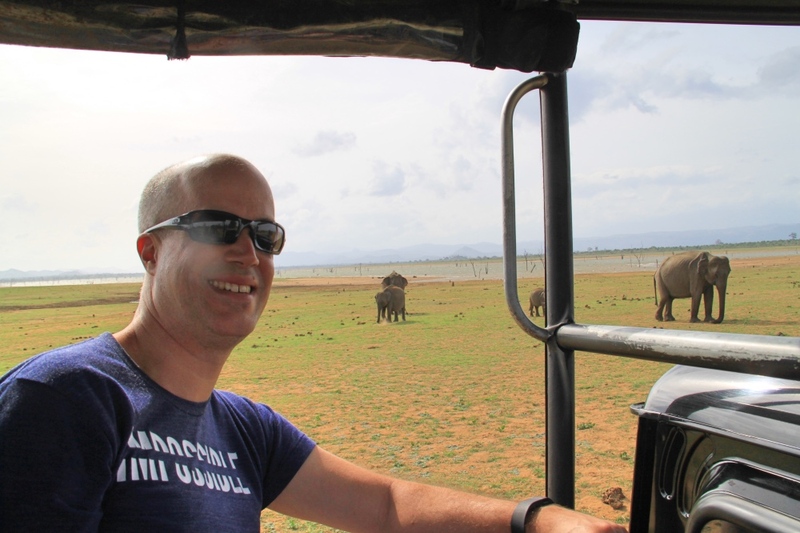 I’ve been in Southern Africa in several National Parks, but not in Sri Lanka. How is it with the tourist crowds? Is it possible to see wildlife quietly without other safari vehicles next to you? Hi Marcelle, I haven’t been to Africa yet so it’s hard to compare. There were a few jeeps around but it didn’t feel too crowded at least not at the time of the year we went. Our guide took us to some places where we were the only one there. So I wouldn’t say it’s very touristy. This is so nice! To see elephants in the wild, not in “parks” of some sort – so nice of you. 🙂 I can only imagine the adventure. Your photos are great, one can see that you did have a lot of fun. I can only imagine what it was like to be that close to them. Your photos are great, it’s easy to sense that you did have a lot of fun. Love the photos. It is great to see the elephants up close. The fares seem bit expensive though. Almost 7k including ticket and vehicle hire. Thanks Gokul, Yes it’s quite expensive. It’s less if you travel with a group of people as the jeep hire is the same whether it’s one or eight of you. It’s funny, most people when they think of a wildlife safari will automatically assume you’re talking about Africa, but in fact Asia has just as incredible experiences. 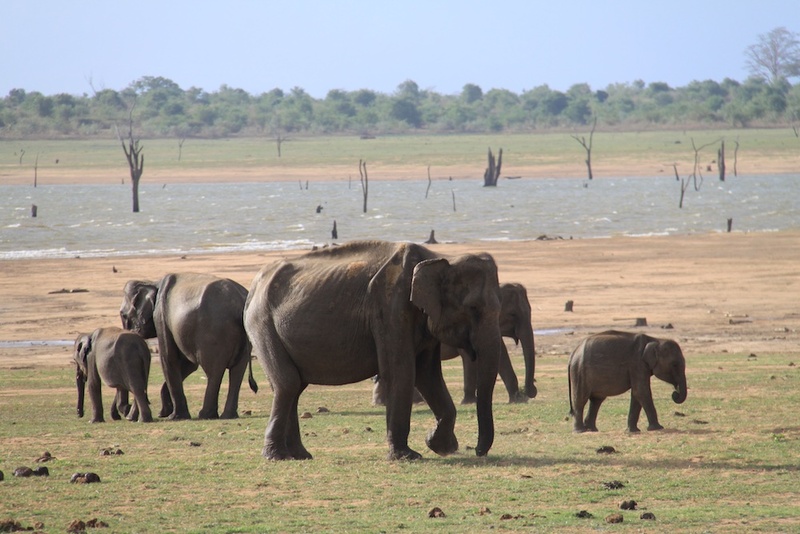 Udawalawe National Park sounds really special, and I would love the opportunity to see such beautiful elephants in the wild. They came so close to your 4WDs!! Wonderful wilderness… it does seem a bit expensive but then safaris are never cheap. Loved to see those elephants from such a close range. Sri Lanka indeed is a hidden gem that is only beginning to realize its tourism potential. OMG!! Such a beautiful creatures. This is definitely one of the things I need to see in Sri Lanka. I love going to this kind of safari. It makes me feel really close and attached to nature.